Out of all companies and offers I didn’t expect that I will get such a one from Saudi Airlines. Though the timing could have not been more perfect for me. I had signed up for the Saudi Al Fursan program last year when I was travelling with them for Umrah and today I received one offer I was waiting for. 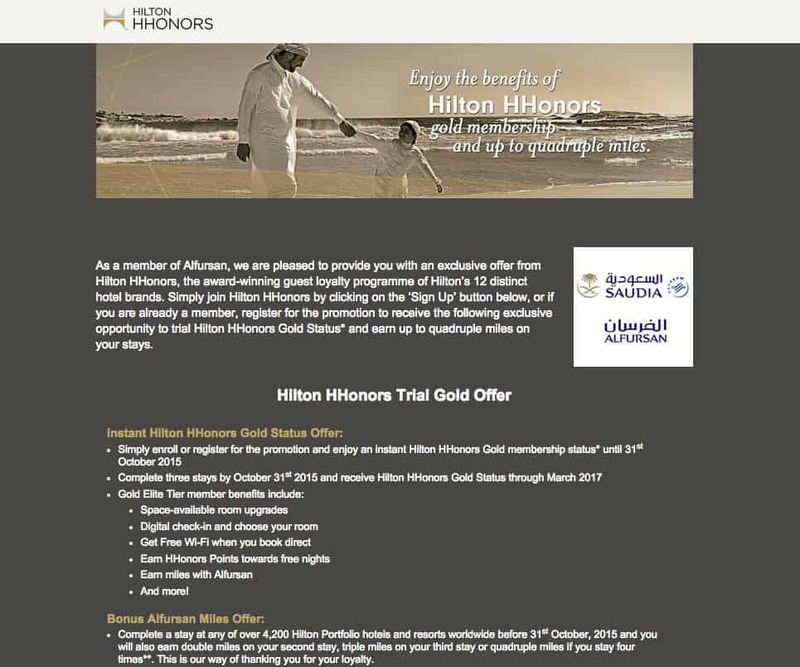 Hilton Gold status from Al Fursan and Hilton after only three stays and the status is valid until March 2017. I have written a while back about the benefits of the Hilton Gold status and was sharing the link with some readers (rather popular one). You will receive instant Gold status until October and if you complete the stays you keep it until March 2017. I really like Hilton hotels Gold status I think it is the best status out there when it comes to mid-chain hotels. They have great coverage and you do get free breakfast and internet; you also receive upgrades and lounge access. The breakfast and internet can cost as much as your hotel stay so it is well worth it. If you were to actually receive Gold status by staying at Hilton properties you would need 40 nights or 20 stays. So compared to the 3 nights you need this is a bargain. I am not sure if this will work for you as the email does state that it is only for the recipients of the email, but I thought it is great for those who do have an account with Saudi Airline’s Al Fursan program. You can find the terms and conditions here. The offer worked great for me and I would say you check your “promotions” section of your emails as well. The mvp code works best. Unlike Hyatt, there isn’t a large set of corporate codes to use for hiltons.